This recipe is mostly protein and fat. Serve it with a side of complex carbohydrates such as brown rice, quinoa, or fruit to keep it balanced and stabilize your blood sugar. Preheat oven to 350ºF. Season chicken with pepper if using. Bake for 20 minutes or until chicken is cooked through. While chicken is cooking, make balsamic reduction. Pour balsamic vinegar into a non-stick pan over medium heat. Bring to a boil then turn down to medium-low heat and allow vinegar to simmer. Keep simmering, stirring occasionally, until vinegar is reduced by half (to a 1/4 of a cup) and is a syrup consistency. Remove from heat and set aside. When chicken is cooked, remove from the oven and top each chicken breast with 2 slices of mozzarella, 2 slices of tomato, and 2 basil leaves. 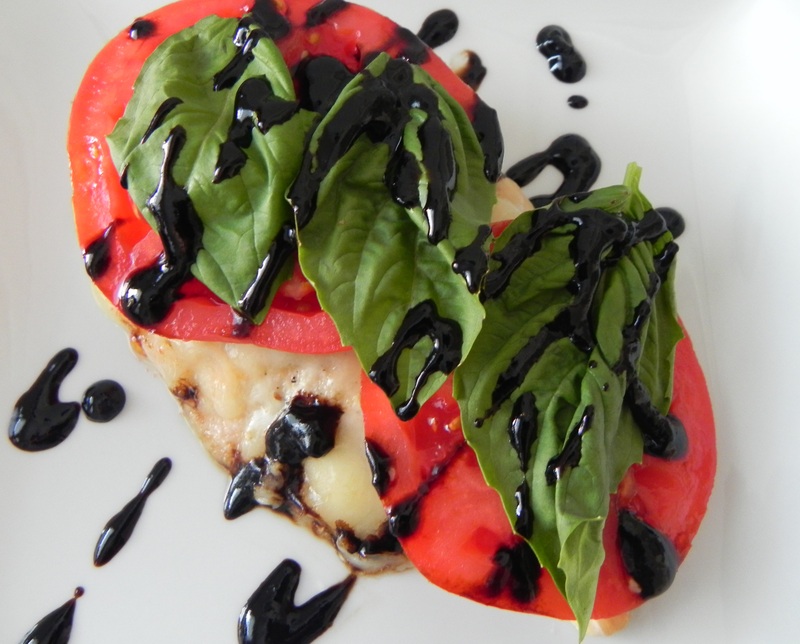 Drizzle with balsamic reduction and serve.